← Bring me my spear! 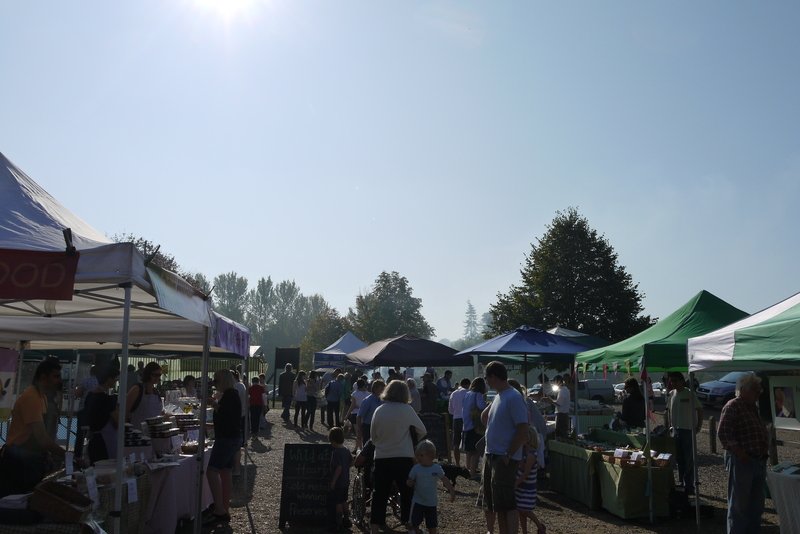 I’m cooking asparagus at Penhurst Farmer’s Market…. With the recent drawn out cold winter and spring finally behind us, this should be the month when everything starts to get going for both young livestock out in the pastures and in vegetable plots. With sun up at 4 am and setting at 10pm, growers and producers are at full stretch and the fruits of their labours should now be in glorious evidence at your local market. So make sure you make the most of all this wonderful bounty and fill your basket with the very best the country has to offer! For growers one of the biggest indicators of our late spring was the delayed start to the asparagus season. Asparagus is now here and the season will be shorter than normal so don’t miss out on one of the joys of our climate – sweet tender spears of the green stuff picked and cooked the very same day. Try it traditionally steamed with melted butter or if the weather gives us some warm June days, griddle the spears on the barbecue brushed with olive oil until tender then scattered with shavings of a sharp hard cheese such as Lord of the Hundreds or a tart fresh goats cheese crumbled over. Or make into a perfect risotto with the first tender broad beans (freshly picked little pods can be enjoyed whole) and fresh green peas. Other veg to look out for are crisp radishes, spring onions, spinach, and of course new potatoes. And if the weather is right there may be early cucumbers, runner beans and courgettes, alongside all kinds of salad leaves now in season. It’s also the ideal time to plant out ‘ready to plant’ herbs and summer bedding plants. Spring lamb is now at its very finest now and a boned out shoulder or leg is perfect on the barbecue or simply roasted and served with baby new potatoes and minted broad beans and peas. On the fish front it’s really has to be mackerel – bought silvery fresh from the market and cooked the same day to enjoy at its very best. Try it the traditional way for the month – grilled and served with a tart gooseberry sauce. Also good this month are lobster, plaice, sardines and clams. Aim to plan a wonderfully labour free picnic if your visit to the market coincides with a sunny weekend. Fill your basket with a locally made cheese, pate, raised pie or Scotch egg, add a loaf of bread baked that day, chutney or relish, bag of cherries and maybe a punnet of strawberries and you are all set. A bottle or two of a local beer and you have the makings of a feast…. 1. Wash and prepare the fruit. Halve the strawberries if large and stone the cherries if using. Crush lightly with the back of a spoon. Place in a large bowl and sprinkle with the sugar. Pour over the sherry, cover and leave to chill for 2 -3 hours. 2. 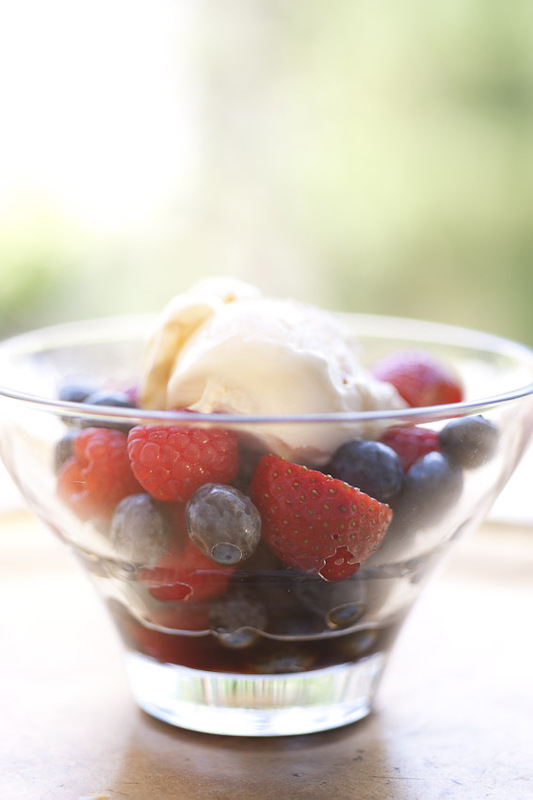 To serve spoon the fruit into glass dishes and top with a scoop of ice cream. Drizzle some of the fruit and sherry juices over the ice cream and serve with biscotti. And by the way I’m going to be doing a cookery demonstration on preparing an easy summer picnic with recipes taken from my two Busy Mum’s Cookbooks at the Wealden Times MidSummer Fair on the 7th June in Rolvenden, Kent. So do come and say hello if you are there…. This entry was posted in In season, Recipes and tagged farmers markets, in season, recipes. Bookmark the permalink.